After you have started WebSite X5 and seen the Welcome Page, you can go to the Project Selection window, where you have to indicate the project you want to work on. or if you want to work on one that you have already created. 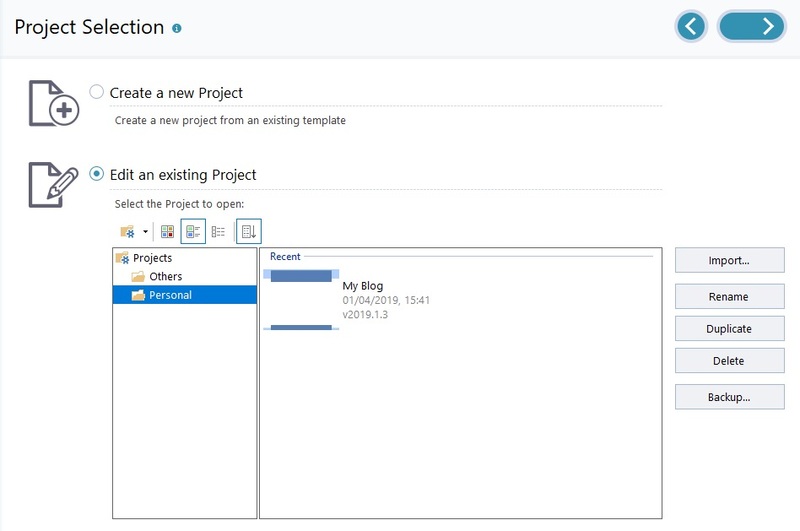 If you choose to create a new project and click on Next, you will go to the Template selection window: if, instead, you choose to edit an existing project, when you click on Next you will go directly to Step 1 - Settings, because the project already has a template. 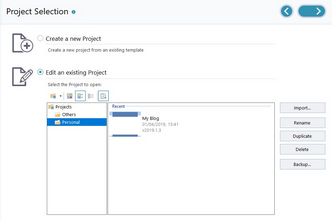 You can customize or change the template in Step 2 - Template. ▪ Create a new Project: choose this option if you want to start work on a new project. The new project will be saved with the name of the WebSite Title that was given in the Website Settings window. You can save the project by clicking on the Save button, which is always present in the top button bar. You don't need to specify a path when you save a project because the Program takes care of that by saving all your projects in the Projects folder which is defined in the Preferences window. If you decide to display the list of project folders, you can create subfolders to better organize how your projects are stored. Show Project Folders: displays the project folders. It has the same effect as clicking directly on the button. New: creates a new subfolder. Rename: you can change the name of the selected subfolder. Delete: deletes the selected subfolder. If you decide to display the list of project folders, you can create subfolders and move projects into them, if you want to re-organize how your projects are stored. If you disable project folder display, the list will show only the projects in the subfolder that is currently open. These options define how the project previews are displayed. According to the chosen visualization mode, the following information can be available: Preview, Project Name, Website description, Date of the last modification, Software version used to create the Project. This option groups and displays the projects according to their last edit date. When opening a Project which has been created with a previous version of the software, a message is displayed informing you that the Project will be automatically converted for the current version of the program. In the same dialog box, you will be suggested to duplicate the project before carrying on with the conversion: in this way, a backup of the project version will be available for the future. ▪ Import...: this command imports a project that has been created and exported (see Export the Project) with WebSite X5 from another computer. ▪ Rename: use this command to change the name of the selected project. You can also click twice on a project name to change it. ▪ Duplicate: makes a copy of the selected project. ▪ Delete: deletes the selected project. ▪ Backup...: opens the Backup Management window so that you can restore a backup copy of the selected project. Making a backup copy is the best way to protect your work. There are several ways to make a backup: one of the safest ways is to copy the .IWZIP file and save it on an external device. When you open a project, if the program detects objects added to pages, products in the shopping cart, and/or blog posts, it will open a window with a reminder to back up and save the .IWZIP file (on an external device, if you want). In this same window, you can also specify if and how often this reminder is to be shown.